Front 15mm Rod Adapter Set Far Back. Extra Space for Accessories and Balance. 10 Track for Balance After Lens Swaps. Large Ergonomic Gel Polymer Shoulder Pad. Rod Adapter Vertically Adjustable 1. Rod Adapter on the Rear. Made in USAWith built-in ergonomic shoulder pad, 10 sliding track, extra space for accessories in front, VCT14-compatible V-wedge, red buttons and levers all around, and much more, this is the stylish. Use it with all types of cameras, from DSLRs to larger models, like the Alexa. 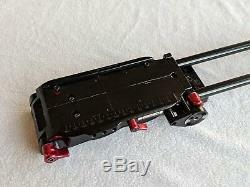 A section of the baseplate extends out beyond the 15mm LWS rod adapter in front. With the rod adapter thus set back, you have additional space to mount accessories under the camera lens, allowing you to position the camera further back on the plate, keeping the balance point of your rig directly over your shoulder. The rod adapter is vertically adjustable 1, and has to be in a raised position to allow for accessories to be mounted in the additional space. Also, a 1.8 riser for the rod adapter is optionally available for RED cameras by special order from Zacuto. Also, on the bottom of the section that protrudes out is where the V-wedge is. There is also a 15mm LWS rod adapter on the rear. The VCT Pro Baseplate features a 10 sliding track, providing the space to optimally adjust balance after every lens change. 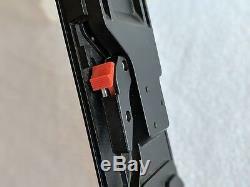 Moreover, the included red camera plate can be loosened by a spring-loaded lever instead of a screw, so you can make adjustments quickly and easily. To fully release and remove the plate (and camera), just press a red button on the side of the baseplate and slide the plate out. The rod ports also have spring-loaded levers. An ARRI M6 rosette is available on the front for attaching accessories and grips, and there are also three 1/4-20 threaded holes on the side providing additional mounting options. 1/4"-20 and 3/8"-16 tripod mount holes are available on the bottom to use instead of the V-wedge. The shoulder pad runs pretty much along the entire length as well as width of the baseplate, and is made of gel polymer. Two 6.5 15mm rods are included. One 1/4"-20 and one 3/8"-16 screw are supplied for the camera plate. 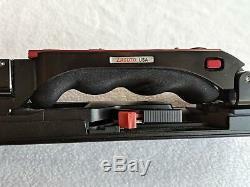 The VCT Pro Baseplate is made in the USA. Front rod adapter is set far back, providing more space for accessories, and allowing the camera to be positioned further back for better balance. 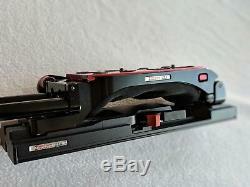 10 sliding track (with spring-loaded lever) for balance adjustment after lens changes. 1/4"-20 and 3/8"-16 tripod mount holes. Ergonomic gel polymer shoulder pad. 15mm LWS rod adapter on the rear. 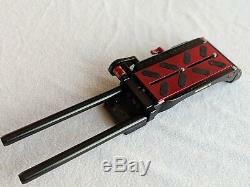 Front rod adapter is vertically adjustable 1"; optional 1.8" riser available from Zacuto for RED cameras. Three 1/4-20 threaded holes for accessories. 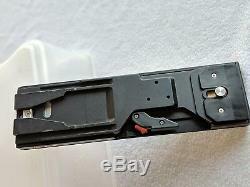 Includes two 6.5 15mm rods. 1/4"-20 and 3/8"-16 screws supplied. Adapts Standard Tripod to VCT-14. 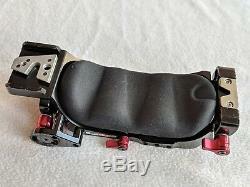 Recommended for VCT Universal Baseplate. Can adapt a standard video tripod head to accommodate VCT-14 camera plates. 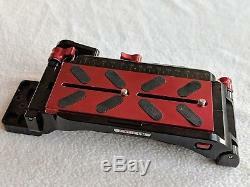 This plate accepts Zacuto's VCT Universal Baseplate for Recoil rigs. The VCT mount allows for quickly transitioning between handheld and locked-down shooting. Two threaded rod ports in the back. 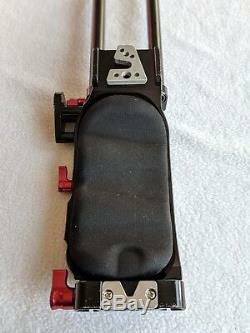 Adjustable tail hook to remove wiggle and accommodate different tripod plates. V-wedge style tripod connector or directly mount your tripod plate via 1/4"-20 & 3/8"-16 screw holes. 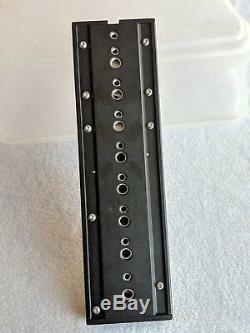 1/4-20 screw holes along the side for accessory mounting options. The item "Zacuto VCT Tripod Plate + Quick Release Shoulder Pad COMBO" is in sale since Monday, December 31, 2018. This item is in the category "Cameras & Photo\Camera & Photo Accessories\Accessory Bundles". The seller is "quality_film_equipment" and is located in Los Angeles, California. This item can be shipped to United States.